Stephen Licht built an unusual underwater robot with a curious name. With a wink toward James Joyce, he named it Finnegan, because he was particularly interested in studying the wake made by the robot as it moved through water. Instead of the usual screw propellers you find on boats or underwater vehicles, Finnegan has four flippers, known to engineers as flapping foils, that roll and twist through the water. 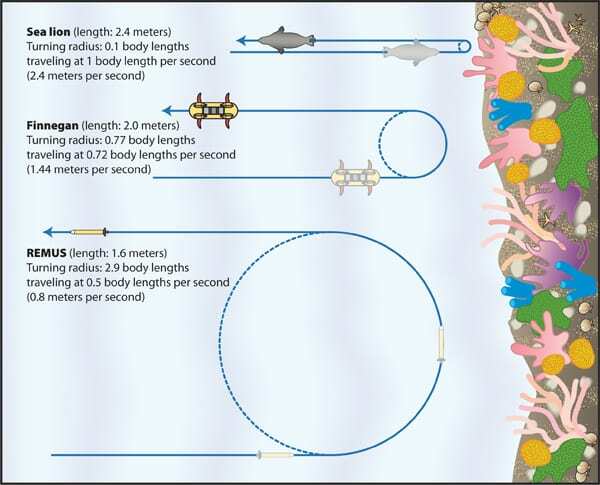 They enable Finnegan to change directions quickly and make sharp turns and back flips to avoid obstacles in chaotic, unpredictable environments, such as the waters near reefs or beaches. Licht’s vehicle looks—and is designed to move—more like a sea turtle than anything else. 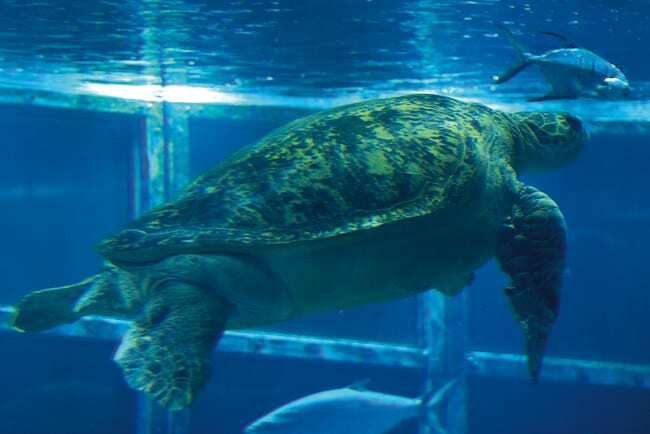 But teaching a machine to swim as deftly as a sea turtle is no easy task. So to make his 500-pound robot more efficient and maneuverable, Licht decided to consult a venerable expert in the field. Her name is Myrtle. She is about the same size and weight as Finnegan, but has much more experience with underwater swimming. She has been doing it for about 70 years, the past 40 in the Giant Ocean Tank at the New England Aquarium. 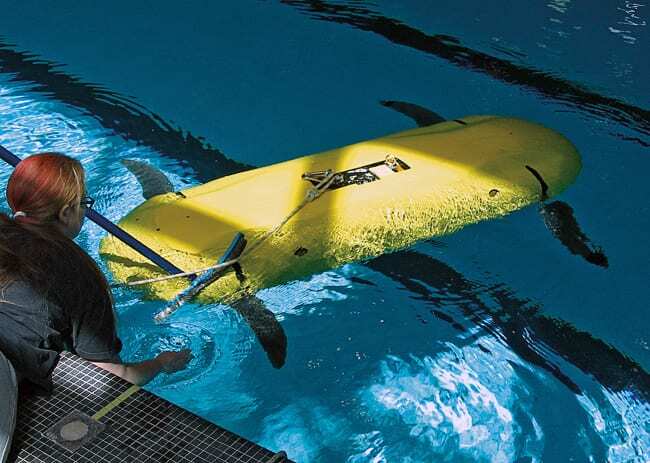 Turtles, fish, penguins, dolphins, and seals are masters at maneuvering in their liquid world, so that’s where Licht, a graduate student in the MIT/WHOI Joint Program, turned to learn how to make the next generation of autonomous underwater vehicles, or AUVs, more maneuverable. Licht worked with his mentors, MIT professors Michael Triantafyllou and Franz Hover, in a field known as biomimetic robotics. Their goal was to observe nature’s solution to a problem, distill it to the basic underlying physics, and apply this new understanding to an engineering problem. “In this case, what we’re really looking at is dynamic, unpredictable flows—like the surf zone, like around obstacles, or in waves,” he said. In such conditions, a vehicle has to respond almost instantaneously to substantial forces from the water around it. You’ve heard the old expression that a battleship can’t turn on a dime. Neither can a conventional torpedo-shaped AUV; its single-screw propulsion is designed to move the vehicle efficiently from point A to point B. This is great for surveys in which the vehicle goes back and forth in long rows, like mowing a lawn. But limited maneuverability means that operators have to avoid dynamic environments or risk crashing and losing a vehicle. One of these lessons is unsteady propulsion. The marine animals mentioned earlier have many differences, but they use their fins, flippers, and flukes in the same way to move through water. The principles underlying this kind of propulsion are different from those for a conventional screw propeller. To better understand how these animals swim, Licht designed Finnegan with four flapping foils. If the key to biomimetics is finding the underlying physics, the key to flapping foil propulsion is understanding the fluid dynamics driving Finnegan’s wake. As the foils sweep through the water, they generate tiny tornadoes of spinning water called vortices (picture the eddies formed when you paddle a canoe). Intricate patterns of vortices spin out into the wake behind the foils. The vortex patterns depend on exactly how the foils move. Some foil strokes produce a trail of vortices with the top set spinning clockwise and the bottom set rotating counterclockwise. Together, they work like cogs in a machine, creating a backward-flowing jet of water that pushes Finnegan forward (see illustration). Other foil strokes make Finnegan pull water along with it, creating a drag wake that slows Finnegan down. Some foil strokes create asymmetric vortex patterns that produce lift­—these push Finnegan up, down, or to either side. Some vortex patterns are efficient; others waste a lot of energy. “You can come up with some very basic characteristics of the wakes that make it relatively easy to predict whether you’re going to get efficient motion, efficient swimming, efficient thrust, and effective maneuvering capabilities out of them,” Licht said. Armed with basic understanding of Finnegan’s wake hydrodyamics, Licht took his robot to the MIT Alumni Pool for testing. With Finnegan functioning at a basic level, Licht began to explore the complexities of more difficult maneuvers with Myrtle, whose body had been tuned by nature through millions of years of evolution. Donning scuba gear, he dove in the aquarium’s four-story, 200,000-gallon Giant Ocean Tank. 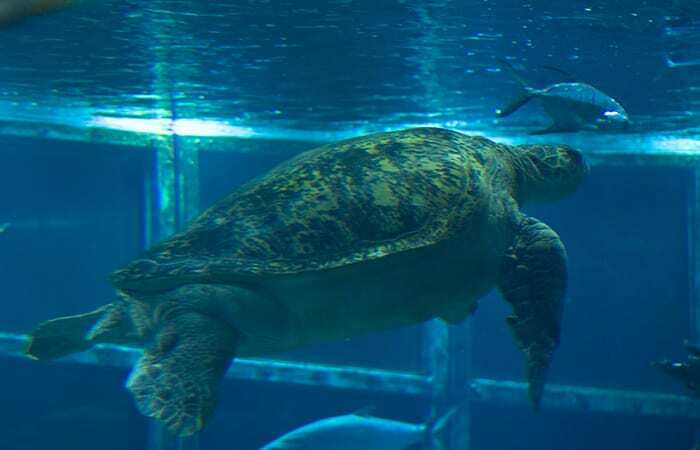 He filmed Myrtle’s flipper movements from different angles as she maneuvered around the tank. Sometimes he worked with another diver to get her to move in a certain way. When she was hungry, Myrtle was a very cooperative subject. “Basically if you give her enough lettuce, she’ll go in whatever direction you want,” Licht said. But there were other times that she just did whatever she wanted. Licht remembers that once he had to bodycheck Myrtle to keep her from running into the camera and flooding the housing. Myrtle was a great example of a natural swimmer. Analyzing her flipper movements provided Licht with further insight on how to coordinate the motions of all four foils to drive Finnegan through a maneuver. Observing Myrtle also prompted Licht to make a slight modification to Finnegan’s mechanical shoulders, allowing them to roll over a greater arc and improving Finnegan’s ability to make level turns. “Watching her do them, it was very clear what we were doing wrong,” Licht said. The shoulder modification also let Finnegan pitch up and invert itself in just two flipper strokes. 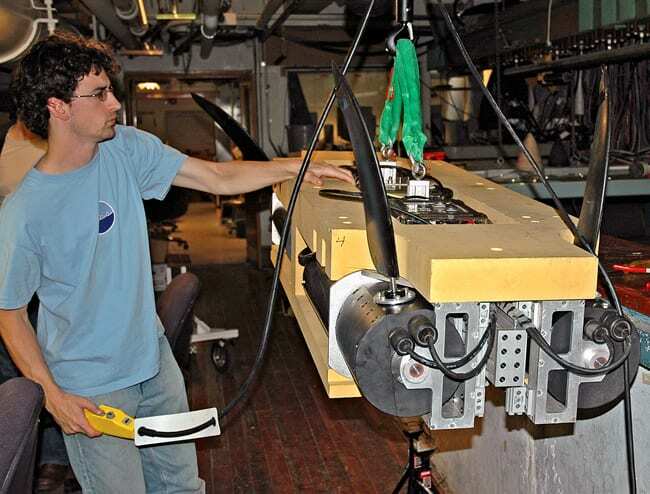 With Myrtle’s help, Licht made Finnegan into a highly maneuverable AUV that could perform aggressive maneuvers to avoid obstacles and turn without losing speed. “We’d run Finnegan up to a meter and a half per second (3 knots, full speed) and aim it at the wall and basically two body lengths away, we would turn it on its side and do a banked turn.” You have to be pretty confident about your vehicle to do a maneuver like that. Licht admits that Finnegan is not ready for the open ocean. The way it is built today, corrosion would be a big problem in salt water. And, even though Finnegan is designed to be autonomous and swim freely on pre-programmed missions, Licht always used a tether, so that if there were ever a flaw in a mission plan or some other kind of technical error, Finnegan could be pulled back in. A lot needs to be done before engineers can put Finnegan in deep water, let it get out of sight, and expect it to come back. Licht likes to remind people that biomimetics isn’t about copying nature directly. Licht graduated in June 2008 with his Ph.D. degree in oceanographic and mechanical engineering. He now works with Vecna Robotics in Cambridge, Mass., designing robots to rescue wounded soldiers and to work in hospital environments. He also teaches part time at MIT for an undergraduate class on Design of Electromechanical Robotic Systems. Myrtle is still swimming circles around the Giant Ocean Tank at the New England Aquarium. Finnegan is hanging around in the MIT Tow Tank and has been dry for several months—waiting for someone (and some funding) to use it to further advance AUV technology and give Finnegan another chance to amaze us with its underwater acrobatics. Stephen Licht’s research was funded by MIT Sea Grant, a Link Foundation Fellowship, and a National Defense Science and Engineering Graduate Fellowship. Jordan Stanway also received an NDSEG Fellowship and support from the Henry A. Jr. and Elisabeth W. Morss Education Fund.This article was written during a science writing course for graduate students at WHOI, supported by funds from The Henry L. and Grace Doherty Professor of Oceanography.